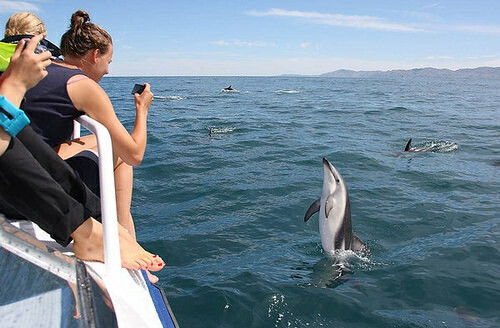 At first glance, you might find it hard to choose between the Dolphin Encounter Albatross Tour kaikoura or the more specific Albatross Encounter. 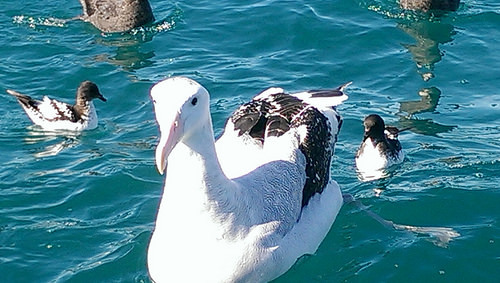 We were after a small group tour and chose the Albatross Tour. 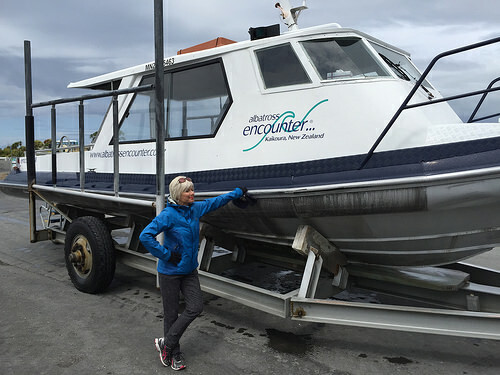 Now the boat for this tour does not have any real degree of comfort – you won’t find any plush seats and a drinks bar. But this type of tour is incredibly authentic. 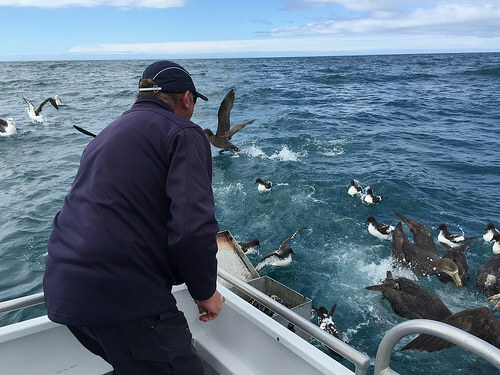 It holds a great appeal to a growing niche market – nature lovers wanting close-up encounters with bird life such as Albatross, giant Petrels and more. Be warned, you need to be prepared for a rocky ride at times. So hold on tight. What you will be guaranteed, is a thrilling adventure and an exhilarating excitement. This experience will stay with you for the rest of your life! 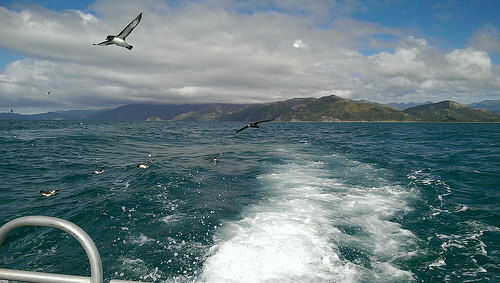 There were only 4 of us on this jet-boat trip to the Kaikoura Peninsula. 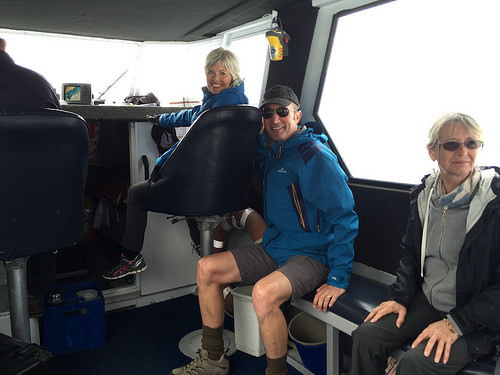 Gary, our Skipper, had a legendary knowledge of New Zealand native birds, especially those of the Kaikoura Region. Handy hint: If you’re prone to seasickness, take your medication an hour before departure. When the boat’s going full throttle, you’ll probably be ok – but once it stops, that gentle rocking might make you feel a bit squeamish. Gary told us that it helps to look at the horizon in the far distance. As it turned out, he was right. 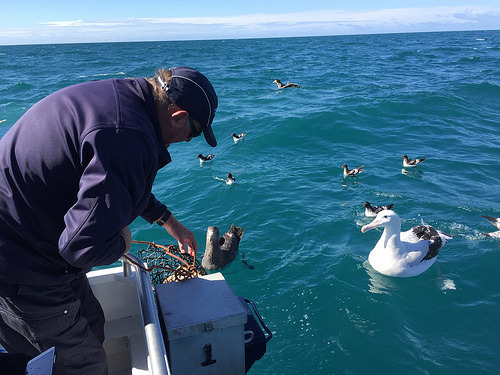 A short while into the trip Gary lowered a chum bag full of goodies that these seabirds love. 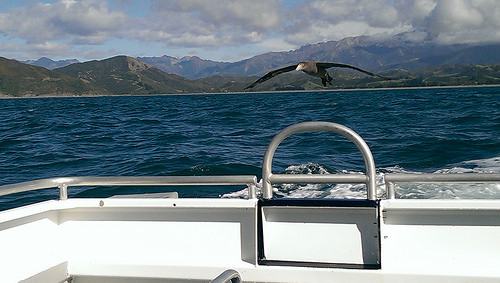 Even before it hit the water, giant Petrels came swooping down around us. These birds were so close, you could have reached out and touched them! I’ve always admired the way Bird & Wildlife photographers can get that perfect action shot. I found out very quickly how hard this can be. Gary lowered last bag of filled with the yummy fish livers. It was time for me to look at the horizon for a while. Suddenly, all hell broke loose. Meat was back on the menu and news travels fast in these parts. The hierarchy was quickly established. 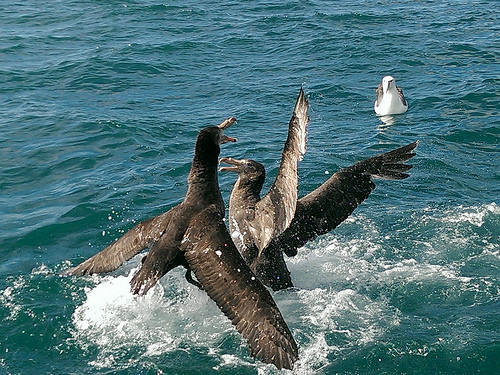 The giant Petrels are incredibly aggressive, but you have to admire the bravery of the smaller Petrels. 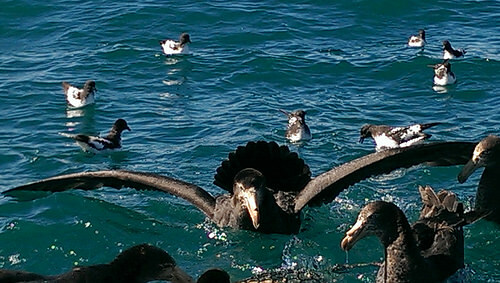 These guys dart around with great skill and they have very sharp beaks that stab. The most heart-stopping moment was sighting two species of Albatross from the Great Albatross family, the Wandering Albatross and the Royal Albatross. These birds can live to 60 years of age and only breed every two years. You can actually hear the ‘whomp-whomp’ sound of their huge wings as they pass the boat. Its times like these you just have to put your camera down and live the moment. These birds are quite reserved, but on the wing, they command the skies. In fact, pound for pound they’re much heavier than the petrels – but far less aggressive. 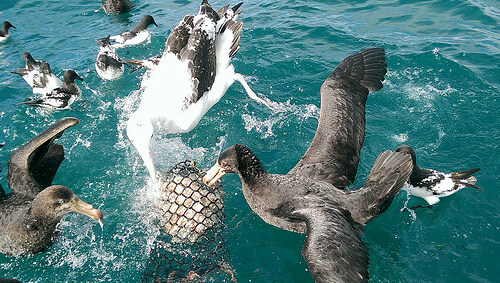 After a while they just folded their massive wings and floated to another boat for feeding. There was a feeling of loss as they glided away. We had a lucky day. 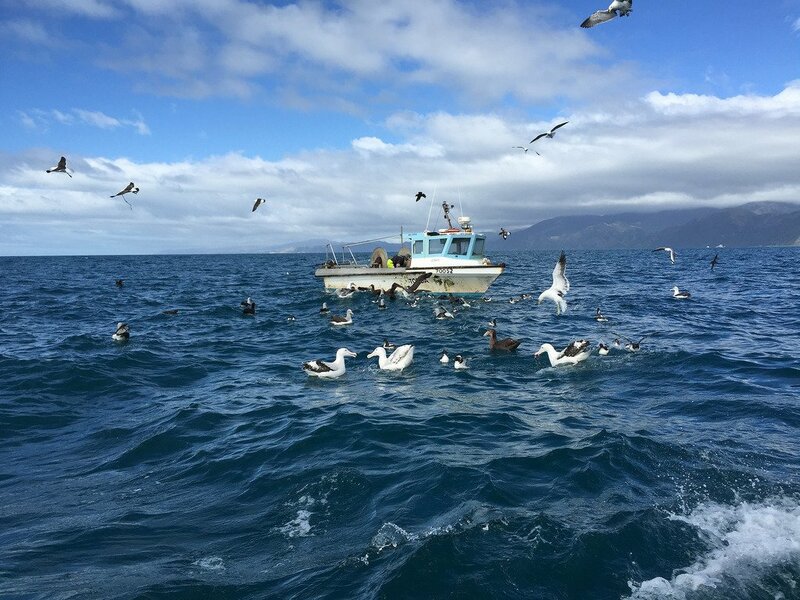 Overall, we counted 45 Huttons Shearwaters, an endemic species only found in Kaikoura. 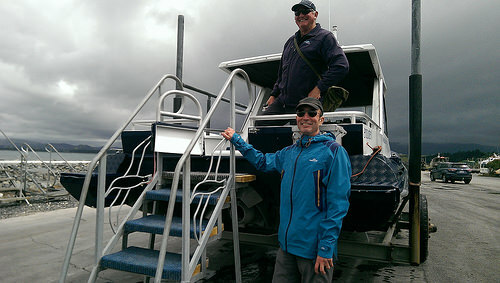 Along the way we saw sea fur seals and a couple of friendly dolphins. The male dolphin was enjoying a mating dance with a female. The agility of dolphins is impressive as is their infectious joy of life. But the impression you’re bound to take from this tour is having seen beautiful bird life in their natural environment. I promise you, having a memory like this will last a lifetime. Another fantastic experience. Amazing to see the size of these beautiful creatures. It was a major thrill for me Jan, having never seen these majestic birds in the flesh before. This is where the true meaning of the word ‘awesome’ is applicable.